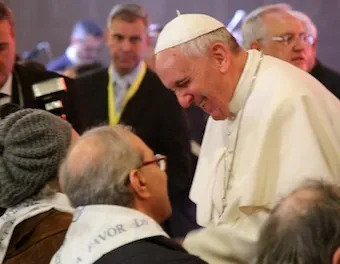 Vatican City, Apr 17, 2014 / 12:49 pm (CNA/EWTN News).- During his homily for Holy Thursday’s Mass at a center for disabled persons, Pope Francis reflected on how Jesus washed the feet of his disciples, calling it an act of loving service that we ought to imitate. “He did it this way out of love. You too should love each other. Be servants in love,” the Pope said in his April 17 homily during the Mass of the Lord’s Supper. Pope Francis greets the elderly and disabled persons following his Holy Thursday Mass at Rome’s Don Gnocchi facility Credit: Lauren Cater/CNA. Celebrated by the Church each year in commemoration of the institution of the Eucharist and Jesus’ call for his disciples to imitate him in serving others, this particular Mass was held in Don Gnocchi facility. Located in Rome’s Casal del Marmo area it serves as a rehabilitation center for the elderly and disabled. Highlighting how this act is a “legacy” that Jesus leaves to us, Pope Francis stated that “We should always be servants to one another,” and emphasized that it is for this reason the Church on Holy Thursday “commemorates the last supper of Jesus,” during which he institutes the Sacrament of the Eucharist. This marks the second year in a row that Pope Francis has chosen to celebrate the Mass of Our Lord’s Supper with those who are often pushed to the margins of society, having visited and washed the feet of inmates in a Roman Youth Detention Center. Among the 12 persons whose feet the pontiff washed are nine Italians, one Muslim from Libya, a young man from Cape Verde and an Ethiopian woman who are all suffering from physical, neurological and oncological illnesses. The youngest of those who had their feet washed is a 16-year-old youth named Oswaldinho who hails from Cape Verde and is completely paralyzed following a diving accident last summer. Not far behind Oswaldinho was 19-year-old Marco, who is a high school student and leader of his parish Youth Group, and who was diagnosed with a cerebral palsy just last year. Eldest of the 12 was Pietro, 86, who has been a resident at the center for a year and who struggles with mobility and muscular deficiency. The second eldest was 75-year-old Hamed, who is a Muslim man originally from Libia, and who worked for the Itlian-Arab Chamber of Commerce before being involved in a traffic accident that caused serious neurological impairment. The other eight who had their feet washed by the Pope are Orietta, 51, who suffers from an illness affecting her brain; Samuel, 66, who has had polio from his youth; Angelica, 86, the former president of Catholic Action in Italy, and has had hip replacement surgery twice; Daria, 39, has suffered with cerebral palsy from her childhood; Gianluca, 36, who from the age of 14 has undergone numerous operations as a result of meningitis; Stefano, 49, suffers from a serious cerebral and motor disorder; Giordana, 27 and from Ethiopia, suffers from cerebral palsy and epilepsy, and Walter, 59, who has Down’s Syndrome.